These delicious little numbers explode with decadence, but you don’t have to feel anything but wonderful after popping a few! Here is why. Research has shown that raw cacao powder, the source of all chocolate and cocoa products, contains more than 300 different chemical compounds and nearly four times the antioxidant power of your average dark chocolate. That’s more than 20 times more antioxidants than blueberries have. How ‘bout that? Possible benefits from cacao powder range from lowering LDL cholesterol and improving heart function to reducing the risk of cancer, not to mention the serotonin release that makes us feel soooooooo good when we eat it. Of these decadent balls we say, “Bring ‘em on,” and celebrate healthy made delish! In a medium bowl, combine 1¼ cups of the unsweetened coconut, almond flour, coconut oil, and coconut butter. Using your hands, massage together. Work it baby! The warmth of your hands will help soften the coconut oil and butter to facilitate the process. Add the remaining ingredients and stir together until well incorporated. Shape into small bite-size balls, about 1 tablespoon each. Put remaining 1/2 cup coconut in a small shallow bowl. 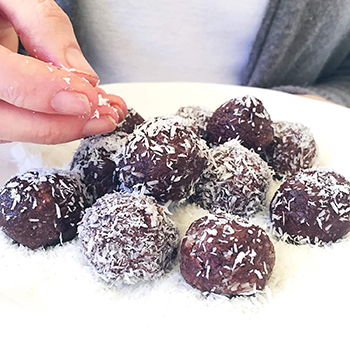 Place 3-4 truffles in the bowl at a time and roll around until lightly covered with coconut. Coconut butter, unlike coconut oil, is made from whole coconut flesh. It’s made using a special blending process that transforms raw coconut into a buttery texture. It is available at Whole Foods or online.